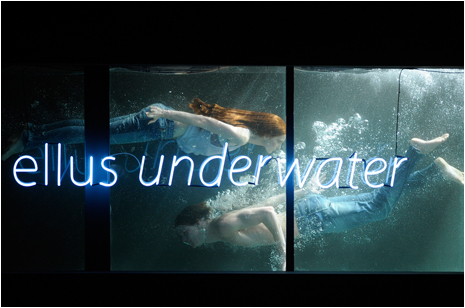 So far Ellus gets my vote for the coolest set designed for the shows this week, with a massive aquarium with models swimming in jeans at the beginning of the runway. Picture courtesy of Agencia Fotosite. For pictures of the Ellus spring 2009 collection, visit Chic. Check out the video by Lula Rodrigues after the jump. Does anyone know about the song for the runway show? I know it's a new version of Born Slippy (from Underworld) but this is a fantastic version. Anyone?